My Good Man, how many of these handsome Saxons do you have left to paint? How about a group photo of the entire lot? That would be something to see! Another spectacularly done Saxon unit - almost too handsome for words! I can't wait until you get to the Cavalry, Phil! Thanks Pete, Saxon Cavalry packs arrived a few days ago! 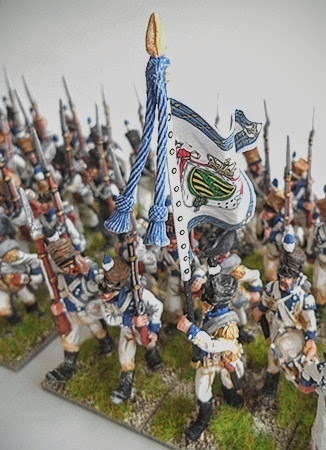 4 (12 figures each) regiments, Three x Chevauleger Regiments (one Chevauleger regiment will be armed with lances for 1813) and One Hussar regiment. More lovely troops in white, Phil! The flags are really nice too. Gorgeous, hope you sleep sometimes! Perhaps Phil is the cobbler of Grimm's fame and has elves working feverishly each night to produce such wonderful works? All these white formations will certainly stand out on a green wargame table, and i agree with above comments, you must have elves working for you round the clock!!! Thanks Chris all the best! More quality work Phil. This is going to be a very impressive army when completed. Hey! how you doing Lawrence? To complete the entire Saxon Corps of 1812, I need 3 Artillery Batteries plus Limber teams and Brigade/Divisional Commanders... long road before finishing off this project...Thanks again Lawrence! A project on the grand scale indeed! 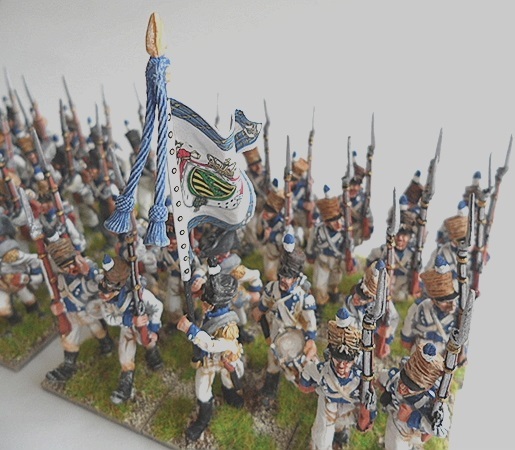 I'm thinking of doing extra work on my Saxon Grenadiers (still look funny to me without plumes) My idea is to drill holes on top of their shakos add on wire use green stuff and design/sculpt my own plumes? Gorgeous stuff Phil, more cracking battalions! Well I don't think anyone can accuse you of being lazy! Outstanding output on a fine looking army!Well done! Thank you so much Christopher for your kind words..much appreciated!.. I wanted to work on the Saxon Corps ever since the beginning of the year but my Renaissance Landsknechts project was holding me back, as matter of fact, I totally lost the plot painting Landsknechts units and decided to abandon the project! and moved on to Napoleonic's - something I wanted to do and be different for a change..